For more than five decades - first as Phil's Radio and TV for 25 years and, since 1977, as John's TV - Phil Rud and John Carlson operated a specialty radio and television store in Paynesville. Rud started the business in 1952, when radio was still popular, and Carlson bought it in 1977 and changed the name. At the start of this month, Carlson closed the 52-year-old business. In an age of disposable televisions, satellite dishes, and cable television, no place was left for television repairmen and antenna installers, according to Carlson. Radio was the prime means of mass communication in America when Rud started the business on Washburne Avenue in 1952. Technology changed the business, as radio gave way to black and white television which then yielded to color television. During the early 1950s, very few of his customers had televisions, said Rud. Back then, television screens were very small and were housed in large consoles. Inside the consoles were tubes - sometimes more than two dozen - and many times, repairing a television meant replacing one or more of these tubes. In the early days of television, picture quality was nothing like it is now, said Rud, but reception in Paynesville was exceptionally poor. "We watched more snow than picture," laughed Rud's wife, Virginia. "I couldn't imagine then how things would change," said Rud, adding that he frequently attended schools to keep up with technology. 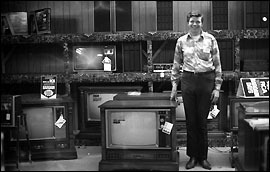 John Carlson purchased his television sales and repair business from Phil Rud in 1977, renaming it John's TV. He closed his shop this year after finding no remaining market for TV repairs and antenna sales. At some point, Rud isn't sure when, the business became known just as Phil's TV, because television became more popular than radios. Carlson, a native of Fergus Falls, started working in TV repair for Rud in 1961 after graduating from the North Dakota State School of Science. When he joined the business, Carlson worked mostly on radios and black and white TVs. During the 1960s, color television became widely available, while the transistor was developed and radios and televisions got smaller -Êand more difficult to work on. The technology was costly, laughed Carlson. Back then, a transistor radio cost more than $30, a lot of money and far more than one would cost now. By the 1970s, televisions and radios were more electronic, said Carlson. Carlson bought the business in 1977, when Rud retired, and changed the name. First, Carlson moved the shop across Washburne Avenue, and then, in 1980, to its current location along Highway 55. As technology changed, so did Carlson's role as a salesman and repairman. During the 1980s, televisions and radios switched to integrated circuits, and Carlson shifted his specialty to installing outdoor antennas. But that work grew scarce as more people switched to cable and satellite reception in the 1990s. Also, during the past two decades, television manufacturers began selling directly to large retailers, making it nearly impossible for small dealers to compete, said Carlson. As a small store, he could not buy in the mass quantites of the large retail electronic stores. And, as televisions and radios got less expensive, repairing them became less attractive to consumers, since frequently repairs might cost more than purchasing a new one. Over the years, Carlson enjoyed working with his customers and growing with the changes in technology. He enjoyed getting to know his customers and delighted in having customers from as far away as Annandale and Hutchinson. One of the best business decisions he made was specializing in outdoor antennas, he said, because that work was especially rewarding. Now that the doors to John's TV has closed and the building is cleaned out, Carlson is working at ACE Hardware in Paynesville and New London while his wife Evelyn works at the store in New London.